March 12, 2019 | By Amy Occhipinti, M.S. Incorporating technology into your business can provide more accurate client metrics so you can create more effective, personalized health programs and help you stay organized when you have multiple clients to manage. 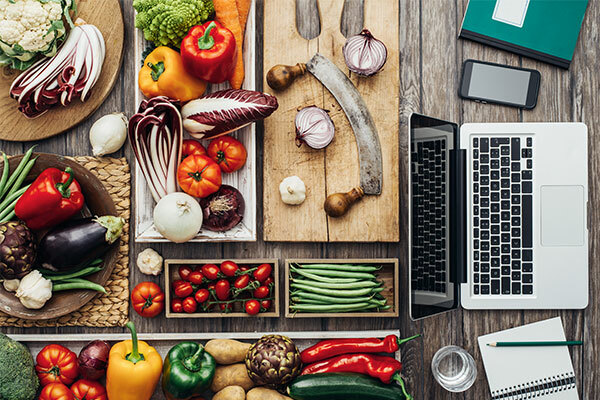 In this article, we’ll dive into our favorite tech for taking your health coach or nutrition business to the next level. Vitabot is an advanced online nutrition program that you can use to private label your health coach or nutrition business. If Vitabot notices that a user’s meal plan is deficient in omega-3’s or vitamin E, it will suggest a list of foods to your client that will help fill in any gaps in their diet. Vitabot performs over 100,000 calculations for each set of suggestions which applies the full science of nutrition, producing great results for your clients. Not only is the user interface beautifully crafted, but it also allows you to private label it under your brand. It’s as if you created this comprehensive technology yourself, making your business more professional and increasing customer acquisition as well as retention. Blueprint Fit is a biomarker testing service that gives you a better understanding of the genetic makeup of your clients’ bodies. The blood test will show current biomarker levels and can also be retested to gauge health and performance over time. Simply order online for your clients and pick the test that aligns with their fitness goals. Then Blueprint Fit’s professional phlebotomists will come to wherever is most convenient for your client to complete the entire draw in under 10 minutes. After the results arrive at the lab, you and your client will receive the results through their online app. With this information, you can create personalized programs catered to each specific client so you can help them get results fast. Instead of relying on conventional scales or making a visual estimation, use the Omron BodyLogic Pro Body Fat Monitor to track your client’s body fat levels. This tool is relatively small so it can fit in your bag if you’re traveling to your clients and need to get their measurements. Perhaps the best feature for health coaches and nutritionists is that it holds memory for up to 9 people/patients so when you’re retesting, you don’t have to re-enter their gender, weight, and height every time since their already saved into the BodyLogic Pro. This is an excellent tool to carry with you and a great bang for your buck. While more expensive lab equipment such as DEXA scanners may be a little more accurate, the BodyLogic Pro is much more convenient and cost-effective so you can get an accurate measurements of your clients no matter where you are. Is your client always dehydrated? Do you often have to remind them to drink water throughout the day? With the Hidrate Spark 2.0, your client will always be in the know. This smart water bottle tracks water intake, glows to remind you to drink water, and syncs to their app through Bluetooth. If your client has a bad habit of forgetting to drink water throughout the day, recommending the Hidrate Spark 2.0 is a great way to ensure they’re staying hydrated without you having to constantly badger them. Many online health coaches and nutritionists use Zoom for video calls with their clients. This HIPAA-compliant video platform is one of the most widely-used software and it’s growing very quickly. With its ease-of-use and simple but robust user interface, Zoom makes it extremely easy for clients who aren’t tech savvy to easily video chat with you. The platform doesn’t require your client to sign up for an account so you guys can set up a call in a matter of seconds. In addition, you can also record and share your sessions, it integrates with hundreds of online apps, and they even have a webinar feature so you can broadcast a video out to a group. Thinkific allows you to easily create and customize online courses to match your health coach or nutrition brand. The platform lets you easily upload and drag & drop content to create a perfect curriculum for your clients. With a personalized program, you’ll save a ton of time by not having to explain your approach to health and wellness to each and every one of your clients. You can even market and sell your online courses by offering membership sites, free trials, upsells, payment plans, and subscription courses. Having online programs (paid or free) can increase your professionalism and demonstrate your authority in the eyes of new prospects. The Oska Pulse is a pulsed electromagnetic field (PEMF) gadget designed to relieve muscle pain, reduce inflammation, and improve mobility by increasing blood flow to certain areas of the body. With the Oska Pulse Active app, you can track your client’s (or your own) pain relief progress and it’s also capable of remotely controlling the device over Bluetooth. Simply attach the Oska Pulse to any part of the body for immediate relief. This is a great device you can carry with you to relieve client’s back, knee, neck, joint, muscle, or chronic pain. Does your client have a gluten or peanut allergy? Nima Sensor is a new handheld gluten or peanut detector designed for allergy sufferers to test their food if they aren’t sure if their food contains an allergen. Nima has two flagship products, their peanut sensor, and a gluten sensor. If you’re working with a client who has an allergy to peanuts or gluten, recommending this product will help improve their quality of life as they’ll know exactly what foods contain trace amounts of allergens. The process is simple. Just insert a pea-sized food sample into the testing capsule and pop it into the Nima device. The display on the device will show you whether or not the sample contains any peanut or gluten, depending on which product you use. Their Bluetooth capability also lets you connect to a smartphone device so you can share your results with the community, search for gluten or peanut free food options, and rate restaurants. If your client is new to dieting and needs help with food options when you’re not around, SmartPlate is a great addition to your client’s kitchen. This device uses photo recognition and artificial intelligence technology to weight, identify and analyze food in a matter of seconds. SmartPlate can recognize over 1,500 different foods, scan 700,000 packaged foods, and accurately tracks important micro and macronutrients such as protein, carbs, fats, sodium, fiber, and sugar. This can save a significant amount of time for you and your client since you won’t have to spend hours calculating and weighing each and every meal. Evolution Nutrition is an online meal planning app that makes it easier for you to build personalized diet programs for each one of your clients. You can either build your own plan for your client or give them free with the apps Self-Service feature. As an online health coach or nutritionist, incorporating Evolution Nutrition into your services will help you manage client data in one central hub. If you’re looking for ways to increase revenue for your business, think about charging your clients for monthly access to their own Evolution Nutrition account. With the help of technology, getting your clients results by maintaining a healthy lifestyle is easier now than ever before. The use of breakthrough technologies allows you to track and analyze client data more accurately which can improve client retention. Whether you’re just starting out with your business endeavors, or you’ve been established for quite some time, incorporating just one or two of the tech listed above can help your health coach or nutrition business be more successful long-term and help clients reach their goals in no time.